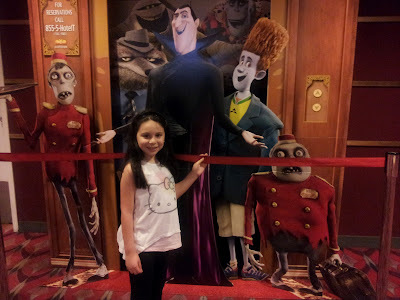 Babblings of a Mommy: Hotel Transylvania: A Monster Fun Movie! Hotel Transylvania: A Monster Fun Movie! Arianna loves Halloween. I mean, looooves it. The decorations, the dressing up, the candy - she lives for it. This year, the studios released three monster-filled movies the kiddies can enjoy around Halloween. We chose to see Hotel Transylvania because it's seemed to be much lighter than the other two. If you want to take your little munchkins to see a spooky movie, but are afraid it might be a little much for them - I would definitely recommend this movie. It has all the classic characters like Dracula, Frankenstein, and Mummy without all the horror and fright. Thanks for the info! Halloween is fabulous:) This movie looks adorable! So happy your family enjoyed!